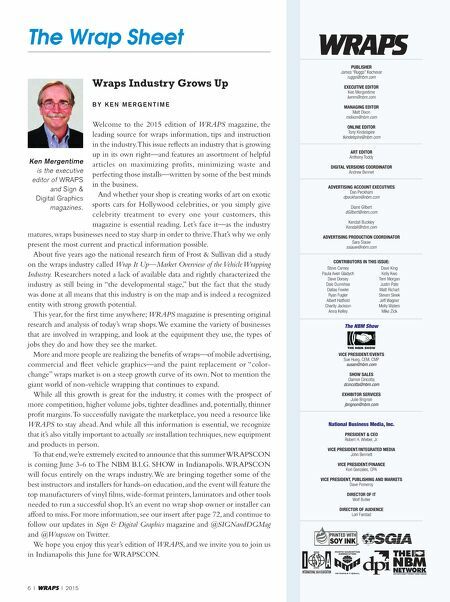 6 I WRAPS I 2015 Wraps Industry Grows Up B y K e n M e r g e n t i M e Welcome to the 2015 edition of WRAPS magazine, the leading source for wraps information, tips and instruction in the industry. This issue reflects an industry that is growing up in its own right—and features an assortment of helpful articles on maximizing profits, minimizing waste and perfecting those installs—written by some of the best minds in the business. 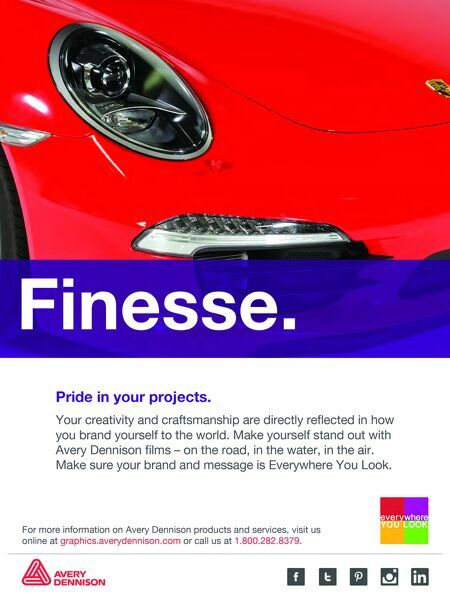 And whether your shop is creating works of art on exotic sports cars for Hollywood celebrities, or you simply give celebrity treatment to every one your customers, this magazine is essential reading. Let's face it—as the industry matures, wraps businesses need to stay sharp in order to thrive. That's why we only present the most current and practical information possible. About five years ago the national research firm of Frost & Sullivan did a study on the wraps industry called Wrap It Up—Market Overview of the Vehicle Wrapping Industry. Researchers noted a lack of available data and rightly characterized the industry as still being in "the developmental stage," but the fact that the study was done at all means that this industry is on the map and is indeed a recognized entity with strong growth potential. This year, for the first time anywhere; WRAPS magazine is presenting original research and analysis of today's wrap shops. We examine the variety of businesses that are involved in wrapping, and look at the equipment they use, the types of jobs they do and how they see the market. More and more people are realizing the benefits of wraps—of mobile advertising, commercial and fleet vehicle graphics—and the paint replacement or "color- change" wraps market is on a steep growth curve of its own. Not to mention the giant world of non-vehicle wrapping that continues to expand. While all this growth is great for the industry, it comes with the prospect of more competition, higher volume jobs, tighter deadlines and, potentially, thinner profit margins. To successfully navigate the marketplace, you need a resource like WRAPS to stay ahead. And while all this information is essential, we recognize that it's also vitally important to actually see installation techniques, new equipment and products in person. To that end, we're extremely excited to announce that this summer WRAPSCON is coming June 3-6 to The NBM B.I.G. SHOW in Indianapolis. WRAPSCON will focus entirely on the wraps industry. We are bringing together some of the best instructors and installers for hands-on education, and the event will feature the top manufacturers of vinyl films, wide-format printers, laminators and other tools needed to run a successful shop. It's an event no wrap shop owner or installer can afford to miss. For more information, see our insert after page 72, and continue to follow our updates in Sign & Digital Graphics magazine and @SIGNandDGMag and @Wrapscon on Twitter. We hope you enjoy this year's edition of WRAPS, and we invite you to join us in Indianapolis this June for WRAPSCON. Publisher James "Ruggs" Kochevar ruggs@nbm.com executive editor Ken Mergentime kenm@nbm.com Managing editor Matt Dixon mdixon@nbm.com online editor Tony Kindelspire tkindelspire@nbm.com art editor Anthony Toddy digital versions coordinator Andrew Bennet advertising account executives Dan Peckham dpeckham@nbm.com Diane Gilbert dGilbert@nbm.com Kendall Buckley Kendall@nbm.com advertising Production coordinator Sara Siauw ssiauw@nbm.com contributors in this issue: The NBM Show vice President/events Sue Hueg, CEM, CMP susan@nbm.com show sales Damon Cincotta dcincotta@nbm.com exhibitor services Julie Brignon jbrignon@nbm.com National Business Media, Inc. President & ceo Robert H. Wieber, Jr. vice President/integrated Media John Bennett vice President/Finance Kori Gonzales, CPA vice President, Publishing and Markets Dave Pomeroy director oF it Wolf Butler director oF audience Lori Farstad Steve Carney Paula Aven Gladych Dave Dorsey Dale Dunnihoo Dallas Fowler Ryan Fugler Albert Hatfield Charity Jackson Anna Kelley Dave King Kelly Kwo Terri Morgan Justin Pate Matt Richart Steven Sinek Jeff Wagner Molly Waters Mike Zick The Wrap Sheet Ken Mergentime is the executive editor of Wraps and sign & Digital Graphics magazines.